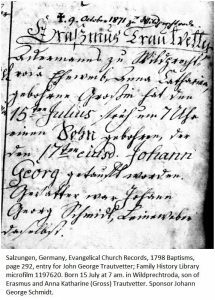 Reading the German language records was difficult and I almost didn’t bother obtaining copies of the baptismal entries for the siblings of John George Trautvetter who was born in 1798. And there in the entry for one of John George’s brother was the indication that their father’s brother was the sponsor. A helpful hint in this case where knowing as many relationships as possible is necessary because every family had a George and a Michael and every son’s first name was Johann. Don’t neglect those ancestral siblings. Join me for my upcoming online AncestryDNA class. Baptismal records hold many treasures. Recently found that my many-time g-grandfather the Rev. Guilliam Bertholf baptized my roommate’s many times (-2) g-grandfather in New Amsterdam in the 1600s. This opened up an entirely new line of inquiry. Was that baptism only available at Salt Lake? And not only was everyone named John, they all had 4 names used interchangeably. Sometimes church records turn up in strange places. In the Frankfort Illinois Public Library in Will County, the Genealogical collection includes a book which lists christenings, marriages, & deaths from a now-defunct German-language Church in a rural area south of Frankfort. This library is very friendly to genealogists, & I found the names of sponsors at the christenings useful.